I’ve never met Rosie, but if her taste in decor is anything to go by, she seems like a nice lady. Her café is very grey-green Farrow and Ball, with industrial pipes across the ceiling. Actually, I may have met her, but I can’t be sure, because I was a little uncertain about who was actually in charge the day I visited. The service was, how can I put it, unobtrusive. I had to do a lot of armwaving and “excuse me please, can I have a fork?” Alert it wasn’t. However, this place is certainly popular. A bright, modern room inside Gosforth’s little shopping mall, next to Sainsbury’s, it’s opposite the Captain Ted playcentre, with its sea of plastic balls and crew of noisy little pirates. The window at the back overlooks Gosforth Central Park. If you think the name ‘Rosie's’ suggests a small family tearoom run by a white-haired granny serving lemon drizzle cake on blue Wedgwood with images of watermills and cows, you couldn't be further from the truth. This place is large, bustling, with an open kitchen, very good quality local jams on sale, and a queue of people waiting for tables. You can’t book – instead, they have a waiting bench. There are no comfy Starbucks-type sofas, and no internet. They pack you into the wooden tables and chairs and they unpack you back into the impersonal shopping centre shortly afterwards. I’m guessing this might be a good place for a bacon sandwich, and the sausage and mushroom paninis were pouring over the pass as I sat watching the busy kitchen. There are sandwiches and salads, homemade soup and quiche, afternoon tea with cakes and Prosecco. But I was there for lunch, which they serve from 11.30 till 3. I’d heard from friends in Gosforth that the food was rather good, so I’d hoped for somewhere as fresh and ambitious as some of the other independent cafés that have sprung up in the North East in recent years: places like The Roxburgh, in Whitley Bay, with its homemade black pudding (and homemade everything else), or Simon and Maggie Snowball’s warm welcome and fabulous eggs Benedict at their tiny Quay Ingredient under the Tyne Bridge, or even the quirky, arty Ernest in the Ouseburn, with its huge pancetta flatbreads, though I admit I haven’t been there since it changed hands back in January. 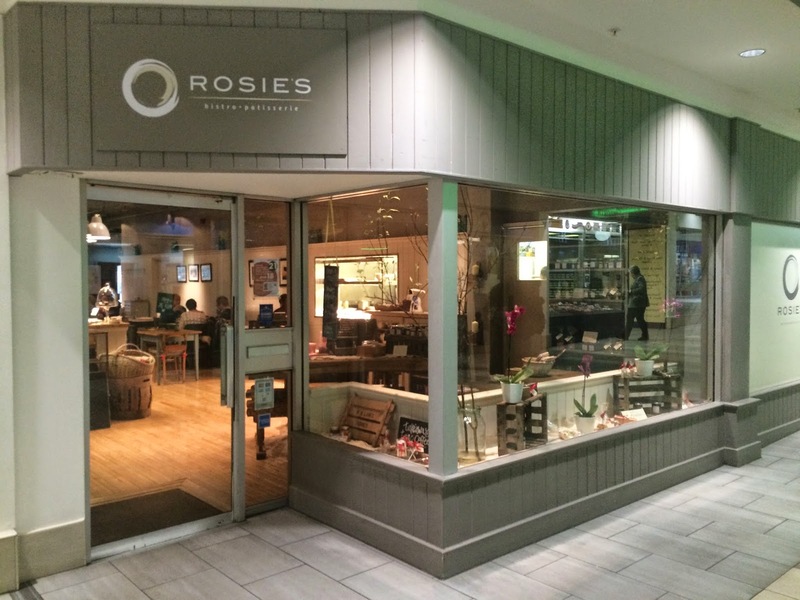 Rosie’s is much more traditional. I’m sure it works for its Gosforth regulars, but the menu, though wide-ranging, is more comfy cardigan than designer top. It’s the sort of café you’d expect to find in Tunbridge Wells or Torbay, with black pudding and pancetta, smoked mackerel, polenta with parma ham, crab cakes, “Asian style chicken noodle broth” and “superfood salad”. That's quite a wide variety for a tiny kitchen. Perhaps too wide. As I was alone, without a Mrs Diner to moan about my waistline, I ordered two starters and a large glass of cheap and cheerful Sicilian white. 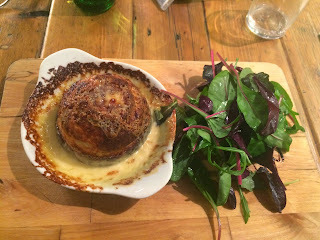 Twice-baked Northumberland cheese soufflé (my third this month) arrived (£7), alongside prawns with garlic and herb butter (£7 for a starter portion). What could be nicer for a light lunch in Gosforth? The soufflé was a touch overbaked – I suspect it started out life surrounded by more of its cheesy sauce before the salamander had evaporated it, but the cake itself was light and fresh. However, the prawns, though plump, appeared to have been prepared with neither garlic nor herbs, poached instead in a buttery sauce that was underseasoned, oily and bland. The salads, too, had nothing about them. 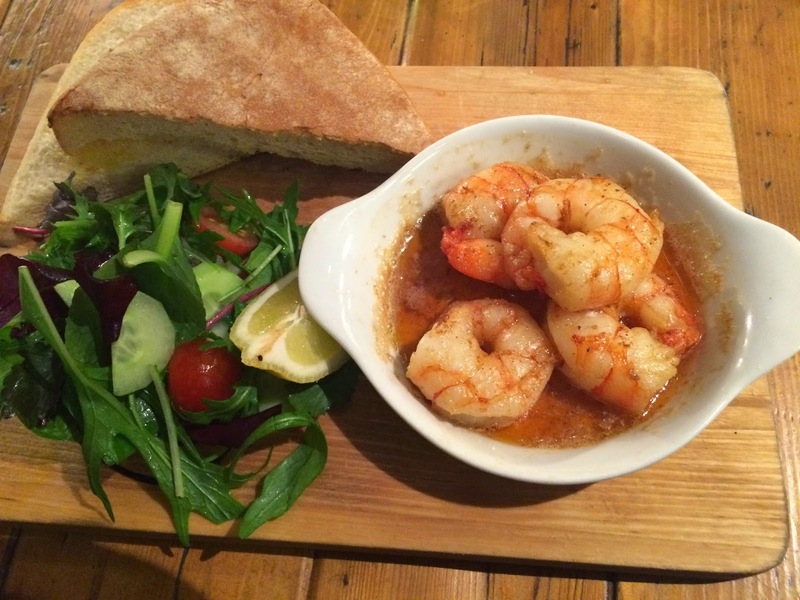 Both dishes were served on wooden boards. Of course. Black pudding, served warm with crispy pancetta, was bought in from Lishman’s of Ilkley and accompanied by more bits of salad and a poached egg. For dessert, 'white chocolate baked cheesecake with raspberry coulis and mango ice cream' sounded like a clashing mishmash to be avoided, while sticky toffee pudding with salted caramel sauce was too obvious a choice. So instead I went for honey and lime brûlée with key lime pie ice cream. Big mistake. 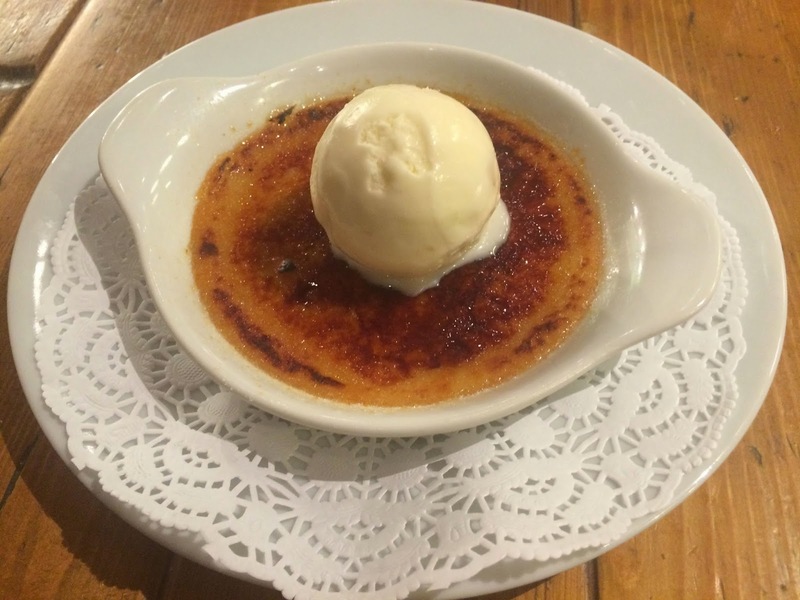 The brûlée was ancient and grainy, tasting of custard and not much else, and the ice cream certainly didn’t deserve the soubriquet key lime pie. I love key lime pie – I hated this ice cream. I suspect this place does some things really well, but I'm afraid I didn’t find them on this visit. My friend insists I give it a second chance, but, to be frank, this is old-fashioned cooking in a safe, staid ambience, which might be fine for a lot of people, but in 2015 I expect more from a city café. I want character, originality and attentive service, and I want a menu with ambition. I also want an internet connection.